This event is held on Thanksgiving Day every year and is fun for the whole family. The event includes 5k and 10k run/walk options as well as a 1k option for kids 10 and under. Along with the main event there are smaller events that include a potato sack race and face painting to keep you children entertained. One of our favorite parts is that this race also takes food, blankets and clothes donations for the Brooks & Brooks Foundation. For 35 Years the Laugh Factory has been putting on a holiday comedy show that welcomes those that are homeless or simply want to enjoy a laugh and the comfort of other people on Thanksgiving. Comedians such as Dane Cook, Tim Allen, Tom Arnold and Shawn Wayans will be there to perform and serve dinner to guests. The Aquarium of the Pacific is offering up the opportunity to have Thanksgiving lunch there and even get to experience their huge range of pacific wild life. They are open from 9:00 a.m. to 6:00 p.m. and they will be serving a Thanksgiving Buffet from 11:00 a.m. to 5 p.m. This is a great way to teach your children about the ocean while abandoning the stress of preparing a huge Thanksgiving dinner. On Friday November 28th, 2014 from 4:00 pm to 8:00 it will be snowing in Old Pasadena. The Holly Street Holiday Celebration will be taking place on Holly Street between Fair Oaks and Raymond Avenues and there will be 20 tons of snow for your kids to frolic in there. Alongside the snow there will also be a craft village for kid’s to make cards, ornaments and the opportunity to get pictures of Santa and Mrs. Claus! The yearly Holiday Marketplace is the perfect place to unique and handcrafted gifts from local and international artists. With festive cocktails and live music the Holiday Marketplace is great for getting holiday shopping done while also escaping the stresses of Thanksgiving weekend. 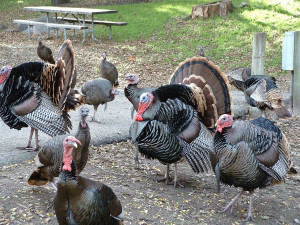 We hope you enjoyed these 5 Thanksgiving Events taking place in Los Angeles. From the family here at Marina Del Ray Toyota we’d like to wish you and your family a happy and safe Thanksgiving!